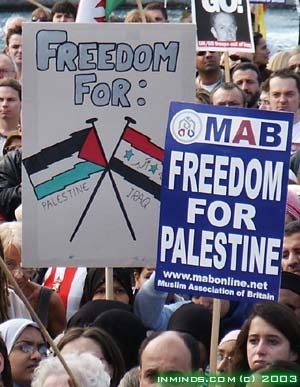 The third anniversary of the Al-Aqsa Intifada saw over 100,000 ordinary people of all faiths and races on the streets of London marching in support of Palestine and against the occupation of Iraq. The day was also important because the next day was the start of the Labour party conference. 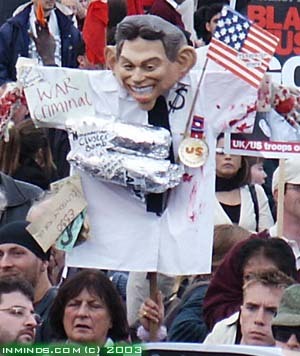 The prime minister Tony Blair had already declared that he didn't want the invasion of Iraq to be mentioned at the conference so the rally took on the extra responsibility of voicing the peoples views on the occupation of Iraq and the wall of lies surrounding the reasons Britain went to war. 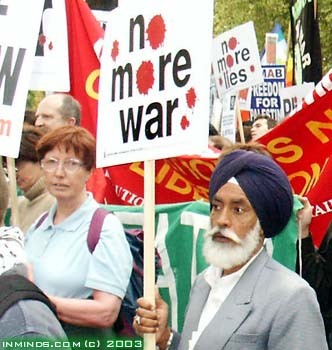 It was jointly organised by the Muslim Association of Britain,, Stop the War Coalition, and Campaign for Nuclear Disarmament(CND). 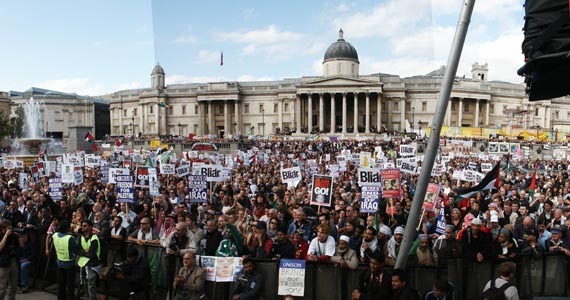 The march set off from Hyde Park down Park Lane to culminate in a rally at Trafalgar Square. Around 30 speakers addressed the rally, we have most of the speeches, around 2.5 hours worth, available on this page in real audio format (both for listening and downloading). 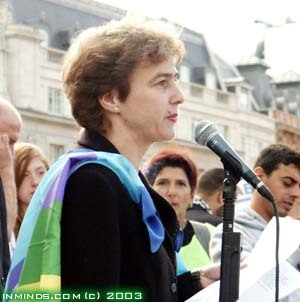 Speakers included the regular favourites as well as many new and important faces. George Galloway was on top form as he described Tony Blairs decision not to discuss the war at the party conference: "Its like having an elephant sitting in the corner of your living room and not being prepared to mention it". And he had a suggestion about this years bon fire night: "Guy Fawkes who's had a hard enough time all these centuries - after all he wasn't the only man to enter parliament with bad intentions, lets replace Guy Fawkes on the top of those bon fires with George W Bush and Tony Blair!". 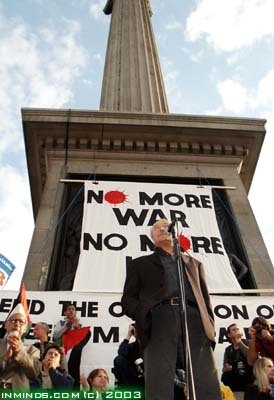 Tony Benn described Trafalgar Square as "the real parliament of this country". Ken Livingstone, the popular Mayor of London, spoke of Sharon: "Sharons hands are covered in blood - the blood goes up to his arm pits! He has had fifty years of slaughtering Palestinians." Dima Tahboub, the wife of the murdered al-Jazeera journalist Tareq Ayyoub gave a very emotionally charged address - many both in the crowd and on the podium were reduced to tears as she described her life without Tareq, and the double standards which meant that his killers - US soldiers - would go unpunished: "what I'm supposed to tell my two year old daughter Fatimah? Am I supposed to tell her that the people who killed her father were never brought to justice and were probably awarded military honours for their performance during war?" Sophie and Billy Hurndall spoke of their brother Tom who was shot in the head by Israeli soldiers. Billy described his own visit to Palestine, "I travelled to Palestine - I wanted to find these answers for myself. In short, I found the answers that I feared. Palestinian blood spilt, quiet often at the hands of laughing Israeli soldiers". 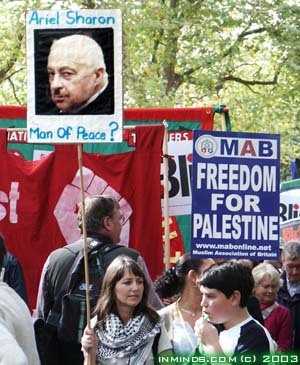 He castigated the media for betraying the British people by concealing the truth about Palestine. 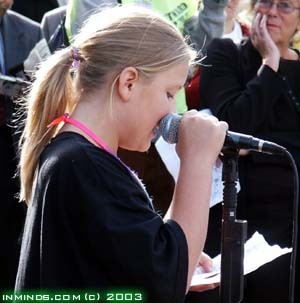 Eleven year old student Rosana spoke of how she wrote a letter to her pro-war MP asking him how he would feel if someone bombed his home and killed his family and friends. Azzam Tamimi, the spokesperson of the Muslim Association of Britain, warned the European Union to stop encouraging Sharons butchery by giving him green lights: "when the European Union proscribed Hamas as a terrorist organisation. Immediately afterwards, within the hour, israelis sent their f16s to assassinate Sheikh Ahmed Yasin and hell broke again". Ismael Patel from Friends of Al-Aqsa talked of the need to "dismantle" the "discriminatory ideology" zionism and "de-zionise Israel". Film maker Ken Loach responded to the announcement that the US provisional authority are to sell off 192 publicly owned Iraqi companies: "they smashed the shop front and now they are reaching in and grabbing the jewels! 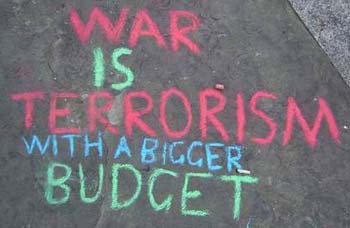 I think we cannot oppose the war unless we oppose corporate power at the same time - its one and the same issue!" 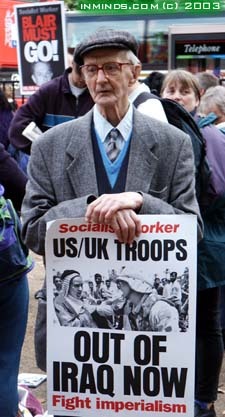 Campaigning journalist George Monbiot warned against replacing US troops with UN troops in Iraq. He said "the best place for the US armed forces at the moment is pinned down in Iraq because while they are stuck there they can't go on and invade anywhere else!". 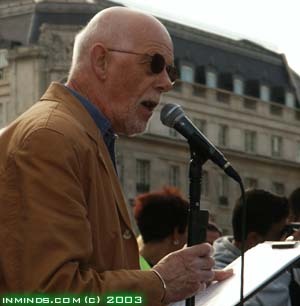 The London rally was not alone, similar demonstrations on the same day took place all across the world with huge turnouts in Spain, France, Italy, Greece, Austria and South Korea..
Poem: It Wrong Right Honourable? 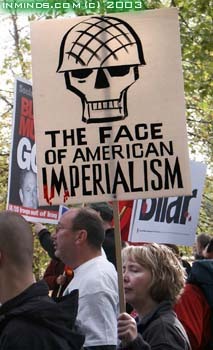 Is America still in a position of power and hegemony? 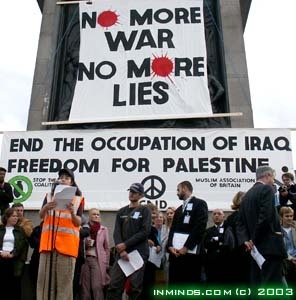 "US / UK Troops Out Of Iraq"
"...the worst crime going on daily - the apartheid wall - must be dismantled. The wall with which the Israelis are annexing fifty percent of the West Bank so that they can include the illegal settler colonies. A wall which is separating the Palestinians from their lands, from their schools, from their hospitals, from their families. A wall which is destroying Palestinian farms, orchards, and olive groves. 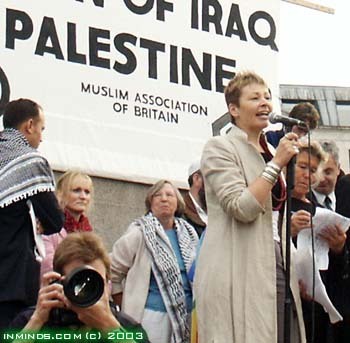 No one can believe that a government constructing such a wall wants peace and security, Sharon's government is a government which wants to deny freedom to the Palestinian people, they want subjugation..."
Ariel "Adolf" Sharon a "man of peace"
Caroline Lucas, Green Party Member of European Parliament. "...The post-legacy of this war is intolerable. 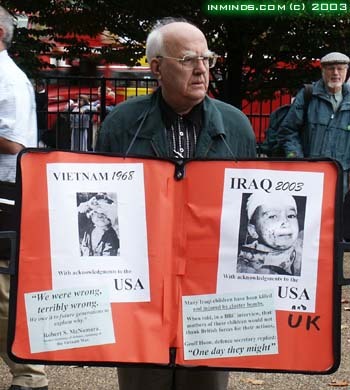 Over 20,000 Iraqi people are dead, plus the bombs and depleted uranium cover their country. No public services - no electricity, no water supply, people insecure unable to go out of their homes. And then we have the grim reality of so called coalition justice in Baghdad. We have occupation forces keeping innocent civilians and children for weeks without charge, without questioning, without reason. And when people object, then those people are shot. We have random killings, ad hoc killings, day after day after day. And we are here today to say enough, this must stop! Just a few nights ago coalition forces went to the farm of Ali Kabar and killed three people of his family and injured his children. And when the Americans came the next morning to apologise for their mistake, one of the remaining members of the family said "they promised us freedom and democracy. They kill our people, they destroy our homes. Is this what they mean by freedom?" Is this what they mean by liberation? Well I'll tell you what George Bush means by freedom. 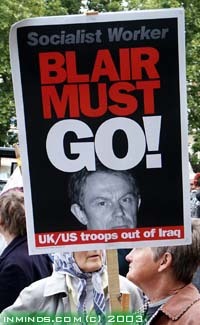 He means freedom for the multinational corporations that allows bleeding the economy of Iraq dry. We've seen the military invasion, now we have the corporate invasion of Iraq. 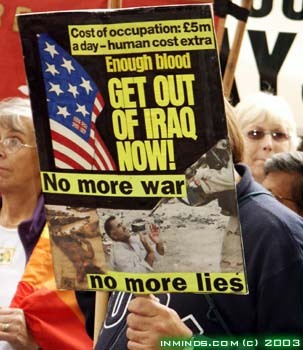 And we are here to say that we find the spectacle of big big business making profit out of the misery of the Iraqi people sordid and obscene..."
"Indict Agents of a Foreign Power with Treason"
against the wishes of the British people. 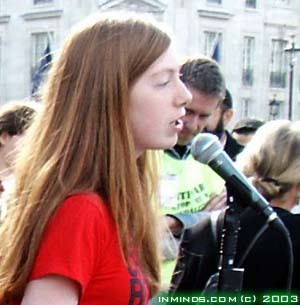 Sophie Hurndall, sister of Tom Hurndall the British photographer shot by Israeli soldiers in Rafah, Palestine. ...In Rafah when Tom reached out to pick up that helpless little girl paralysed by fear he was moving completely outside of concern for his own safety to help someone even more defenseless than himself. In helping those children tom was also sending a clear message about helping those in need. He wasn't prepared to turn his back on innocent people, the same way we must not. 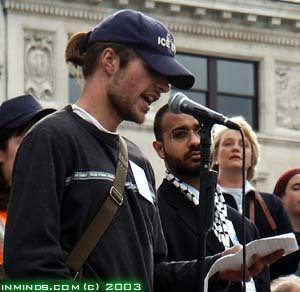 We must treat Tom as an inspiration and not turn our back on the sacrifices that people like Tom have made..."
"He [Tom] was shot through the head in Rafah, Gaza five months ago by an Israeli soldier concealed in a watch tower. He was shot for the simple reason that he was protecting and escorting children from that Israeli snipers fire. I'd like to take this opportunity to talk about how the western media has betrayed us, but most of all betrayed those who suffer because of it in places like Palestine. My brother saw this and as most people do in some way to an extent, but he didn't know anything for sure so he travelled to Gaza to find the truth for himself. He did, he came back a victim of that truth - the truth so painfully denied by the western media at such a cost, as men, women, and children are being slaughtered in Palestine. I don't say this just because I believe it, I have seen this happen. Six weeks after Tom was shot, I was left with a lot of the same questions he had, so I travelled to Palestine - I wanted to find these answers for myself. In short, I found the answers that I feared. Palestinian blood spilt, quiet often at the hands of laughing Israeli soldiers. But when we turn on our TVs, we don't hear about this. We are informed by our media of 'suicide bombers' and an occasional 'retaliatory strike on terrorists'. I don't think I need to say anything on the actual reality of what these 'retaliatory strikes' mean or at the sadistic and constant humiliation, violence and regular effective executions that have taken Palestinian lives in the thousands and injured and crippled thousands more. When you see that sort of thing happening you really have to ask yourself who are the terrorists? 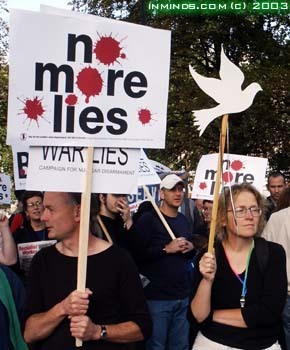 ...When will Israel learn that it can't hide the truth by eliminating the peace workers and then the witnesses?" 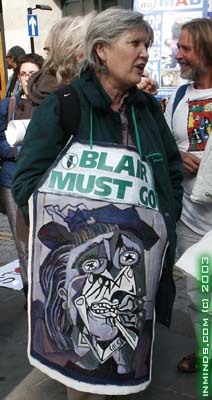 "War Criminal" Blair shown with hands covered in blood. 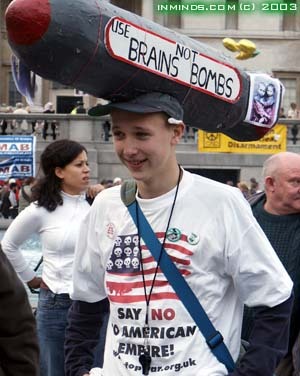 American flag, dollars and cluster bombs pinned to his shirt. 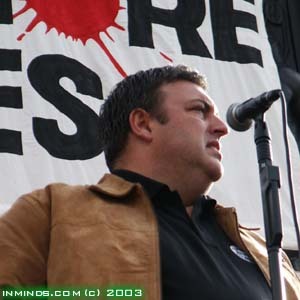 Mick Rix, General Secretary of the Associated Society of Locomotive Engineers and Firemen (ASLEF). "...if there was ever a recognition that there should be an international coalition force, then it is to remove Israel out of Palestine! ..."
stripped of its own sovereignty, sums up how the ordinary British person feels. The first page shows Vietnam 1965 with the quotation of then US secretary of defence Robert McNamara speaking later about the Vietnam war "We were wrong, terribly wrong. We owe it to future generations to explain why." Many Iraqi children have been killed and injured by cluster bombs. 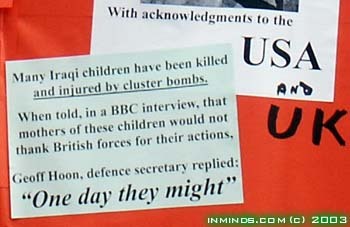 When told, in a BBC interview, that mothers of these children would not thank British forces for their actions, Geoff Hoon defence secretary replied: "One day they might". 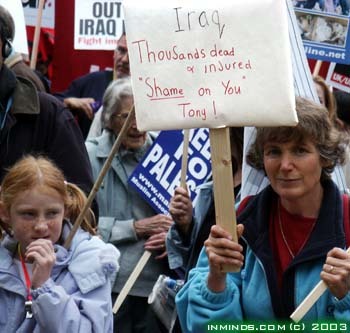 "Iraq - Thousands dead & injured - Shame on you Tony!" 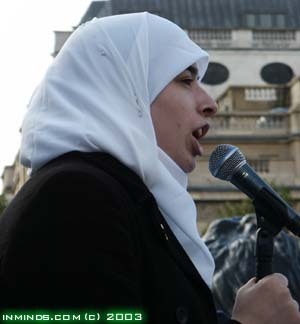 Omayma Al-Khaffaf, President of FOSIS Palestine Campaign (Federation of Student Islamic Societies UK). 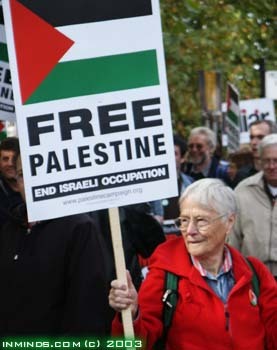 She spoke passionately about the struggle for Palestine. "...Fifty five years on! 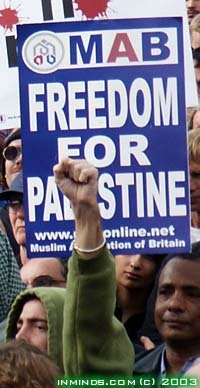 Fifty five years on - the Palestinians continue their quest to be liberated. 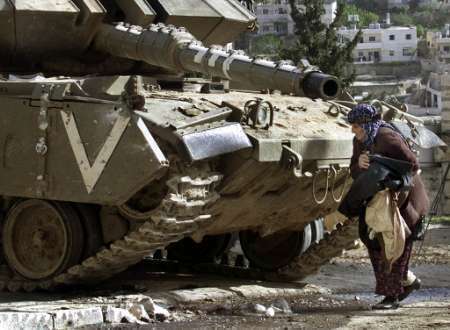 Fifty five years on - the Palestinians are subjected the oppression, occupation and segregation. Fifty five years on - the Palestinians are slaves in their own country. Fifty five years on - we must face the tragic fact that the Palestinians are still not free. We are told time and time again Israel is the only democracy in the Middle East... well if democracy means mass murder, if democracy means robbery of land and persecution, then we say keep your democracy because we don't want it! 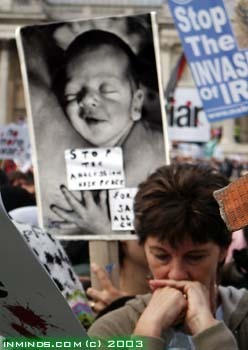 Tony blair why are you silent about Palestine? 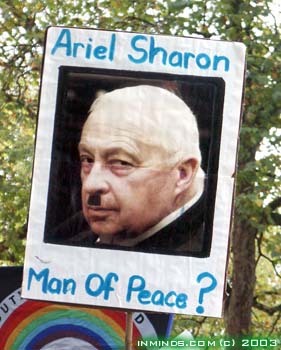 Why are you silent about Ariel Sharon? 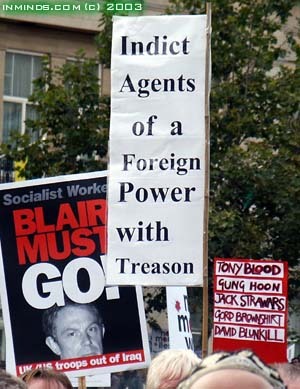 Why the hypocrisy Mr Blair? We can't find weapons of mass destruction in Iraq, well my advise to you is to look to your left - go to Israel you'll find them there! 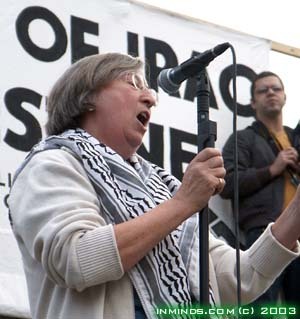 We went to Iraq because of weapons of mass destruction - what about Israel? We went in because of UN resolutions - what about Israel? We went in because of a war criminal - what about Israel? If we use these as a reason to go to war then we should have invaded Israel years ago, now where is the justice?" 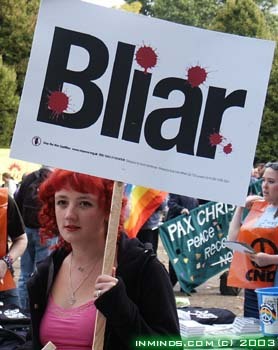 "And why do they resist Mr Blair? Well in the words of Mandela it is the oppressor who defines the nature of the struggle - do not tell people how to resist until you stop oppressing them!" (*) An excellent exposition of this theme can be found in the eloquent words of another great veteran of the struggle against apartheid in South Africa, Imam Achmad Cassiem who spent nearly 11 years of his life imprisoned or under detention, some of which was on Robben Island with Mandela. In the words of Imam Achmad Cassiem : "It is immoral, irrational, it is obscene for an oppressor to tell the oppressed how they should respond to oppression". 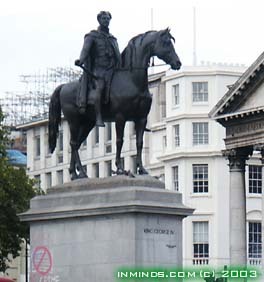 For the sake of all our children"
During the rally at Trafalgar Square, police attempted to arrest a young teenage boy after he had used chalk to create a graffito of a 'no American flag' symbol on the base block of the statue of George IV. Several police surrounded the boy and marched him off away from friends and a frantic parent. Members of the public saw what was happening and began to surround the police chanting "let him go". The police reacted violently as they lost control of the situation, and then set up cordons to keep the peaceful but angry crowd at bay while they searched the frightened young boy in a space between their vans. After a tense stand-off for quarter of an hour, they eventually released the boy who was led away by a relieved parent amidst cheers from the crowd. 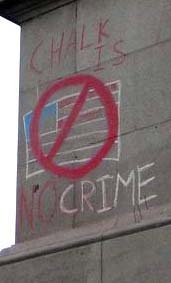 Later someone added the world "Chalk Is No Crime" around the unfinished art. 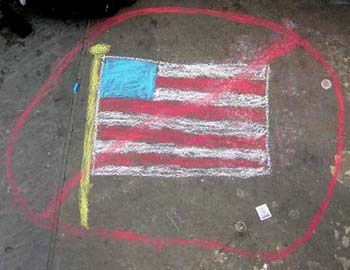 Since chalk unlike paint is not permanent and washes away in the rain it is legal to use. 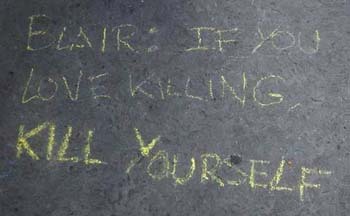 "Blair: If you love killing, kill yourself"
Kate Hudson, CND spokesperson condemns the US occupation of Britain. "...it's not enough for the US to get out of Iraq, and the US to get out of the Middle East, we want to see the US out of Britain as well! There are many US bases - military bases, spy bases in Britain active today. There are many campaigns throughout the country to close down those bases and drive the US occupiers out of Britain..."
"Say No To American Empire!" "The Biggest Threat To World Peace"
Over half of Europeans think Israel poses the "biggest threat to world peace," according to a poll commissioned by the European Commission. The same survey has the United States beating out Iran, Iraq and North Korea  the trio dubbed the "axis of evil" by President George W. Bush  as well as Afghanistan in a ranking of what countries contribute most to world instability. The survey, conducted in October, of people from each of the EU's member nations by Taylor Nelson Sofres/EOS Gallup of Europe, consisted of 15 questions regarding "the reconstruction of Iraq, the conflict in the Middle East and World peace." The poll found 59 percent of Europeans, and nearly two-thirds of Britons, believe Israel represents the biggest obstacle to world peace. The results appear to be a mark of the widespread disgust in Europe for Israel's on going oppression of the Palestinians. They simply do not believe Israel ever wants peace. Israeli Ministers and spokesman, worried that the current definition of 'anti-semitism' doesn't give Israel sufficient protection against criticism, have also been at pains recently to insist that a definition of modern 'anti-semitism' should include criticism of the way the state of Israel chooses to protect itself, defining that criticism as an overt attack on Israel's survival. Reacting to the poll, the Simon Wies enthal Centre, which claims 400,000 members in the US alone, has begun ordering a petition to condemn the European Commission and demand the EU no longer be represented in the so-called Quartet group trying to mediate an end to violence between Israel and Palestine. 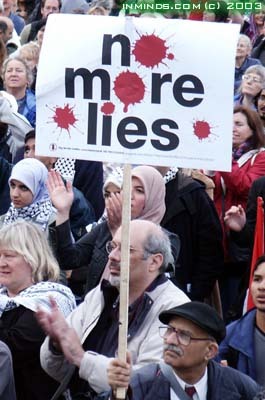 'This poll is an indication that Europeans have bought in, "hook, line and sinker", to the vilification and demonisation campaign directed against the state of Israel and her supporters by European leaders and media,' said Rabbi Marvin Hier, the Wiesenthal Centre's founder. 'This shocking result that Israel is the greatest threat to world peace, bigger than North Korea and Iran, defies logic and is a racist flight of fantasy that only shows that anti-semitism is deeply embedded within European society, more then at any other period since the end of the war,' he added. 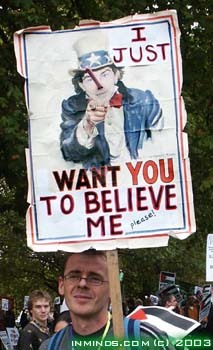 Pinnocio noise poster reads "I just want you to believe me - please"
We have never at any time given our consent to be lead by George Bush, come to that neither have the Americans - judges appointed by his father appointed him! But Mr Blair without our consent has allowed us to be used to further the nefarious cause of bringing about the new American century. 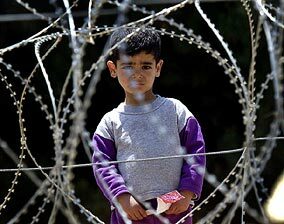 The disgraceful treatment of people including children held at Guantanamo Bay. Christianity teaches us that all people are made in and bear the image of the divine, to violate another is to violate God. We cannot remain silent when faced with the shackled hooded pictures of Guantanamo Bay caged like wild animals. If we don't raise our voices on their behalf now when our turn comes there will be no voices to be raised..."
In October 1937 Picasso painted "Weeping Woman" as a kind of postscript to Guernica, it is based on the early sketches of the mother and child found in that painting. The face shows the pain of the terrorised and dying civilians of Guernica,a small village in Spain that was bombed by the Nazi Luftwaffe in support of Francos fascists during the Spanish Civil War. "Weeping Woman" can be seen at the Tate gallery in London. For an entire generation of Europeans the bombing of Guernica and Picassos interpretation of the event signified the barbarity of fascism and the widespread determination to resist its violence and brutality. Today fascism is on the rise again in the guise of the American empire. To see the actual painting and a commentary click here. 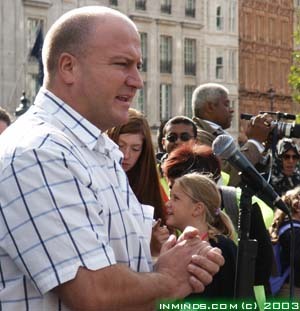 Bob Crow, General Secretary of the RMP Union (Railway Workers). "...Its no good just turning around and saying we want Blair to resign - where was the rest of the cabinet when he was making those decisions? Where was Prescott? Where was Milburn? Where was Blunkett? 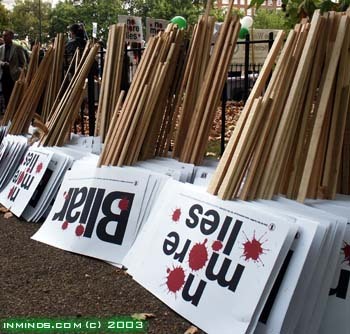 Every single one of them backed Blair to the hilt, and they should be thoroughly ashamed of themselves. They contemplated war when the war was about to be announced, and they are all war criminals today..."
Rosana & Hana, representing School Student Against The War. "...Hello my name is Rosana, I'm aged eleven. 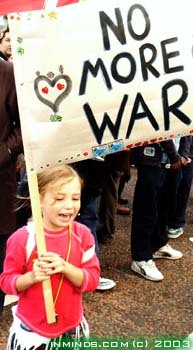 I am against the war and I was on a huge anti-war demonstration of two million people. 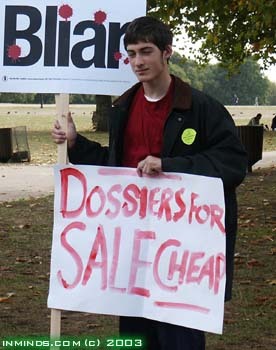 Tony Blairs government lied to us. I wrote a letter to my MP Ivan Henderson who supported the war. I told him I was against the war and I asked him how he would feel if someone bombed his home and killed his family and friends. He sent a reply saying he supported Tony Blair. Well he's just ignorant, war mongering, just like his leader!..." I live in Harwich and two weeks ago it as announced that they were going to close down a maternity unit. A protest was organised and we organised a school strike. We encouraged people to leave school at lunch time and protest at the closer. They have money for war and to murder people but we can't have a maternity unit or a 24 hour accident emergency department! Thats why we went on strike and we will strike again!..." 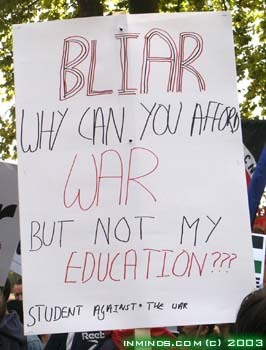 "Blair why can you afford WAR but not my EDUCATION ?" 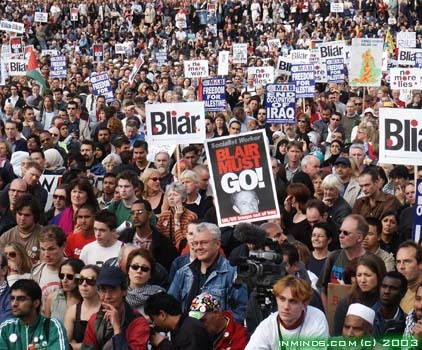 On the day US and Britain began their war on Iraq (20 March 2003), following a lobby at Lewisham Town Hall, a number of those on the lobby, including a group of school students, boarded the 185 bus to make their way to the protest at Parliament Square. Before it could depart, the police boarded the bus and announced that the school students were truanting and that they would remove them from the bus and return them to school. When it was pointed out that the school students had the consent of their parents and that some of parents were present, the police brutally arrested Karl Debbaut. Any appeals for calm were met by the police dragging them off the bus, handcuffing them and throwing them into the waiting police vans. Rene Bravo was dealt with in this way, the appeals by his wife, Marcela Massingnotti, saw her arrested as well. Four adults (three of them parents) and a student were arrested. Karl Debbaut, Rene Bravo and Marcela Massingnotti are all facing serious charges - Karl with assault occassioning actual bodily harm, Rene and Marcela with assaulting a police officer. 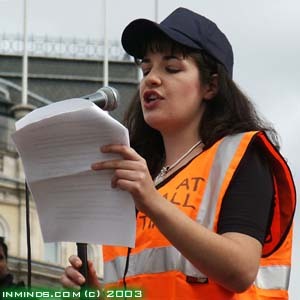 30 July 2003: All of the charges against 2 of the Lewisham 3, Rene Bravo and Marcela Massingnotti were thrown out by the magistrate at Belmarsh. 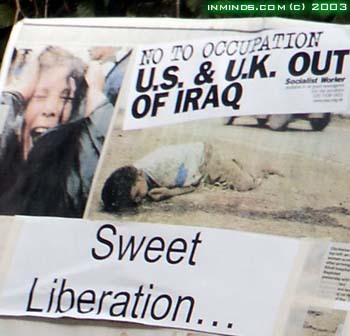 This a victory for the right to protest, a victory for the millions that campaigned against the war and still campaign against the occupation of Iraq and the war aims of the Project for the New American Century. 'cause you can't possible relate to me. You are the American red, white and blue. Each day you wake in tranquillity. Each day I wake in gratitude. The bulldozers and the tanks. The gases and the guns. But you don't know it the way I do. So let me define the term for you. And teach you what you thought, you knew. Fifty- four years and more. 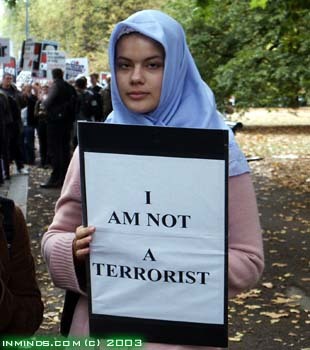 Terrorism is the robbery of my land. And the torture of my mother. The imprisonment of my innocent father. Then you will never see a day of peace. Nor will fight for justice cease. 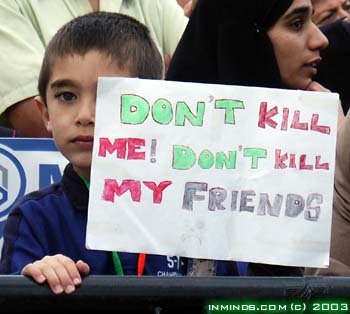 And if I am killed, it will be Falasteen. It's written on my breath.